The Cosmographia by Sebastian Munster from 1544 is the earliest German description of the world. It had numerous editions in different languages including Latin, French (translated by François de Belleforest), Italian, English, and even Czech. The last German edition was published in 1628, long after his death. The Cosmographia was one of the most successful and popular books of the 16th century. It passed through 24 editions in 100 years. This success was due to the fascinating woodcuts (some by Hans Holbein the Younger, Urs Graf, Hans Rudolph Manuel Deutsch, and David Kandel). It was most important in reviving geography in 16th century Europe. Map source: Old map by MUNSTER - [Tartaria]. Google wants to know if by "shumerlya", did I mean "sumeria". But, can't be Hyperborea, wiki clearly states "Founded in 1916, it was granted town status in 1937." But, can't be Hyperborea, wiki clearly states "Founded in 1916, it was granted town status in 1937." THE morning of 29 August 1949 dawned sunny and clear in the Altai mountains in southern Siberia. Most of the region’s 2.3 million people, which included Tartars, immigrant Russians and displaced Germans, were out in the fields working the soil. Some of them remember seeing “a light in the sky” to the west, but they had no idea what it was. They just carried on working. Only now is the real story of what happened that morning beginning to emerge. Russian scientists have revealed that tens of thousands of Altai people suffered sickness, cataracts, cancers and premature deaths because of one of the world’s worst nuclear disasters – and one of its best-kept secrets. The unfolding tragedy is already yielding new insights into the dangers of radioactivity. The light in the Altai sky was a sign that, more than 170 kilometres away, the Soviet Union had surprised the world by exploding its first atomic bomb. Ruled only by Stalin’s urgent need to prove that he could do what the Americans had done in Hiroshima and Nagasaki four years earlier, Soviet bomb technicians had designed a crude nuclear test that was almost bound to be an environmental catastrophe. 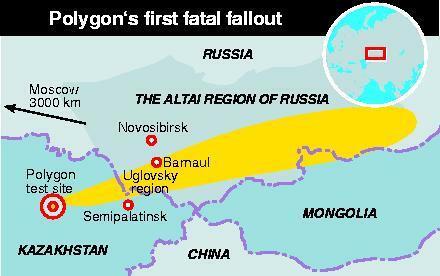 They hung the bomb 33 metres above the ground on a gallows-shaped rig at the Polygon test site, just to the west of the city of Semipalatinsk (see Map), which is now part of Kazakhstan. The rig was nicknamed “the goose” because of its resemblance to the bird’s neck and beak. Crucially, nobody worried about the weather forecast or the wind direction. Apart from a few communities in the immediate vicinity, which were evacuated, nobody seemed to care about how the rest of the region’s population might be affected. Edit: to keep on topic, if we took archaeology at face value, then the "civilisation" of north Asia (think Mongols, Tartars, Turks etc.) was definitely associated with Scythian or proto-Scythian introgression at some point in the "distant past". So, we have things like the Abashevo culture spreading into what is now south Russia at an early date, and subsequent expansions which led to e.g. Tocharian civilisation (Tarim Basin mummies etc.). Most of Siberia has been confirmed to have been inhabited by "white, fair people" until more recently, when other native Siberian groups, Turkic peoples, and the Chinese started to come into greater prominence in the region. Note I said "other native Siberian groups" - we've also confirmed (apparently) that the origin of the white man is in Siberia... Or at least, that's where our Y-DNA seems to come from - our fathers' fathers' fathers came from Siberia, hence our connection to Siberian and native American peoples, who all share what's called "Ancient North Eurasian" DNA. The fact that Mongolic/Turkic/Tartar culture has a heavy emphasis on horsemanship makes it pretty clear that these cultures have their origins in the "Scythians" (or proto-Scythians), because horsemanship was first developed somewhere north of the Pontic-Caspian Steppe (i.e. in west Russia of today), where proto-Scythian culture had its genesis. Horsemanship doesn't turn up in Asia until after the Abashevo expansion, so it would stand to reason that what became Tartarian culture took much influence, if not the basis of its expression, from incoming Scythians/proto-Scythians (I say proto-Scythian because Scythian is a broad tribal ethnonym, and the Abashevo expansion might have occurred before these groups called themselves "Scythians"). Always interested me to see Scythia marked almost as a "province" of greater Tartaria - again, this might suggest to me that the Scythians-as-Scythians (i.e. the "tribes" called Scythian) were a later addition to a broader cultural horizon that had spawned from those members that travelled east earlier (e.g. Abashevo or other migrations). Another interesting facet to consider, as I've mentioned in the "Fairytale" thread, is that the bulk of modern Europeans are also descended from the same basic group of proto-Scythians, albeit from different migratory waves. This might perhaps suggest a connection between esp. northern/central/eastern Europe and Great Tartary. If we gave Scythia the greatest benefit of the doubt, and incorporated all groups that were ethnically or culturally descended from them or their forebears, then most of north Eurasia would be their territory - perhaps "Greatest Tartaria"!